Dad of girlfriend: "I'm glad justice finally came before he hurt my daughter"
(CNN) -- Drew Peterson, the former police sergeant who authorities call the prime suspect in the disappearance of his fourth wife, Stacy Peterson, has been indicted on murder charges related to the death of his third wife, Kathleen Savio, the Illinois state attorney's office said. 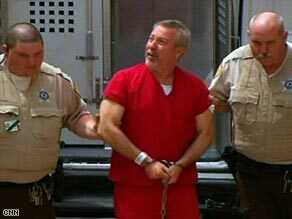 Drew Peterson was transported from jail to the courthouse for an appearance Friday. Peterson appeared in court Friday, but a judge delayed his arraignment until May 18. Police had staked out his home all day, police Capt. Carl Dobrich said, but waited for Peterson to leave to arrest him out of concern for his three young children, who were in the house. Through his attorney, Peterson denied any wrongdoing in either case. Wills County State's Attorney James Glasgow said he thinks the case is strong and said Peterson is being held in lieu of $20 million bail. "This is an extremely grave and serious matter, and it is reflected in the bond," Glasgow said. Charles B. Pelkie, a spokesman for the state's attorney in Will County, Illinois, said a grand jury indicted Peterson in the death of Savio, whose death had once been ruled an accidental drowning. Brodsky said in a statement that prosecutors won't be able to prove their case, because "he didn't do it." After Stacy Peterson went missing in October 2007, media and police scrutiny of Peterson revealed that Savio had died mysteriously during a nasty divorce a few years earlier. Savio died just before the division of marital assets was finalized, making Drew Peterson the sole beneficiary. The investigation into Stacy Peterson's disappearance brought renewed interest in Savio's death. Authorities exhumed Savio's body, further tests were conducted, and her death has been ruled a "homicide staged to look like an accident." Brodsky told King that he thinks the case has always been about circumstantial evidence and that he will bring a pathologist to trial who will say Savio died in an accidental drowning. "The state police had been telling us the day was coming," he said. "We kept hearing it for about eight months. I'm almost in tears here. It's been so hard for our family. Martin Glink, attorney for the Savio family, said they were hopeful the grand jury felt that there was enough evidence to charge Peterson. "We're very happy that the wheels of justice have continued to move and they are pointing in his direction," Glink told WLS. The news was bittersweet for Stacy Peterson's family, who continue to wait for news about her disappearance. "We have anticipated this coming. We have dreamed about it. We have been patient over it," family spokeswoman Pam Bosco told WLS. "Now that it's here, it's almost a little bit calm. We're waiting for the storm to calm now. The calm before the storm." Bosco said she was hopeful there would be charges in the Stacy Peterson case. "We always said from the very beginning that Kathleen and Stacy had one thing in common, and that was Drew Peterson," she said. "So, hopefully, we'll have news soon about Stacy, too." Ernie Raines is also relieved about the arrest. His daughter, Christina Raines, is dating Peterson and was living with him before his arrest. Raines told CNN's Anderson Cooper that he was with his daughter and Peterson as recently as last week, when they talked about going to Las Vegas, Nevada, and getting married. Thursday night, he spoke with his daughter after the arrest. "My daughter was terrified, very emotional, upset," Raines said. "And I tried to tell her from the beginning that this was going to happen, be prepared." Raines said that when he heard about the arrest, he was more relieved than anything. "I'm glad justice finally came before he hurt my daughter," he said. Police put Peterson's three young children in the custody of the state's children and family service department. His adult son was contacted, at Peterson's request, to take them, according to Dobrich.